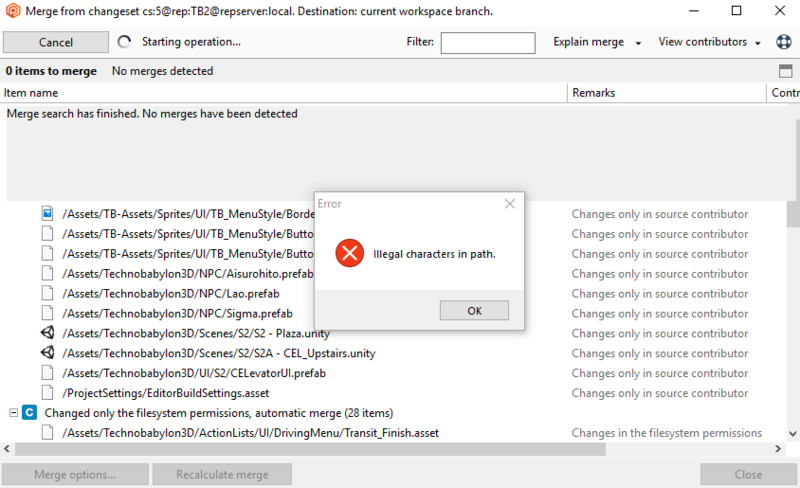 When my colleague tries to push to our repository, he gets the error message "Illegal characters in path." He closed the window, and told it to check in to a new branch instead, but it wouldn't comply because "a merge is in progress". It told him that the only way to proceed was to either proceed with the merge (which it wouldn't, because illegal characters), or to undo the changes, which reverted it to a version before he had made any changes. How can we fix this? Our repository is unusable at the moment. I have attached a screenshot of the problem. As far as I know there are no non-ascii characters in the filenames because the game is purely in English. What characters are disallowed? Are spaces OK? Could you attach the client logs to review them? Is your coworker try to checkin or running a merge (according to the screenshot)? The key thing here is to figure out the illegal characters so the issue is not happening in the future. Are you both working from a Windows machine? I am working from a Mac and my colleague is using a PC. I'm not sure what he was trying to do, because we are both new to this system, and the UI doesn't make it at all clear. He was trying to do a checkin, but for some reason a merge was triggered? We both work remotely, so I can't see what he does. I had checked in before him so perhaps my work did not automatically merge with his. Here is a link to his logs. I guess you included some characters that are supported in macOS but not in Windows. Most probably, you won't face this error when running the same merge. Could you reach us at support@codicesoftware.com? We may need to arrange a GoToMeeting session. What characters do you support on Windows and not on MacOS? I did not change any filenames at all, or add any files. What I was doing was checking in some slightly changed versions of existing files. I can't show you the problem in GoToMeeting because it doesn't happen on my computer. Windows is a case insensitive OS while macoS is case sensitive but it's difficult to know the character that is generating this error. The log is not showing it. We can connect with the user having the problem to try to find a workaround and determine the characters generating the issue.